Discussion in 'ESET Smart Security' started by lowlife, Sep 15, 2008. Got a PC running ESS 3.0.669.0 with latest definition files. When doing internet searches the pages were being randomly redirected. I ran a complete scan using ESS which picked up nothing. 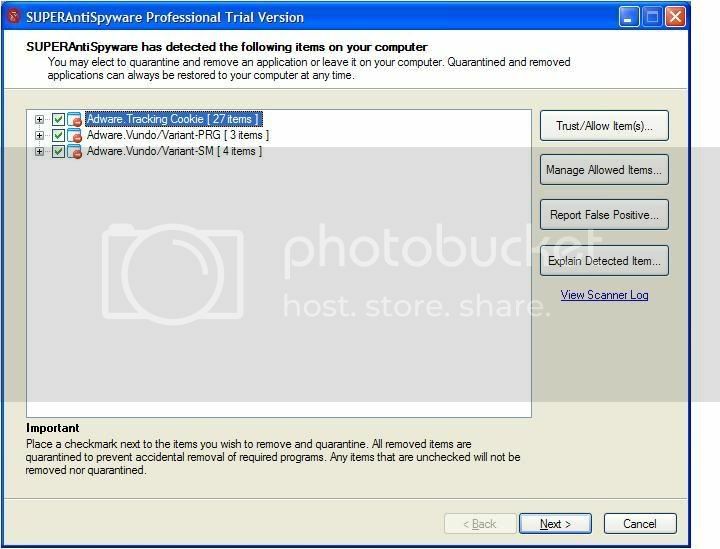 Downloaded a trial of SuperAntiSpywarwe and ran it. Straight away it picked up a Vundo variant (see screenshot) which was causing the problem, deleted and now no problem. I'm a bit worried that ESS completely missed it. The Vundo malware is frequently updated to avoid detection by security software, which is why security software is frequently updated to detect new variants. If you have files which are not detected by ESET Smart Security, please place them in an .ZIP or .RAR archive file file protected with a password of "infected" and mail the file to samples@eset.sk with a link to this message thread.